With the Bollywood actress Anushka Sharma and cricketer Virat Kohli romance still in pipeline, the news of cricketer Harbhajan Singh wedding actress Geeta Basra has brought to fore cricketers obsession for Bollywood beauties or should be say it is Bollywood beauties compassion for the cricketers. Whatever may be the case, history is witnessed to many cricketers romancing Bollywood actresses and few even tying the nuptial knot. Raaga.Com picks top 5 such hot pairs. Father of actor Saif Ali Khan, the great former India captain Mansoor Ali Khan Pataudi, who was known as Tiger for his incredible captaincy and electrifying bating tied the nuptial knot with actress Sharmila Tagore in the mid 60’s. Sharmila Tagore with hit films like KASHMIR KI KALI and AN EVENING IN PARIS was the numero uno actress and reports suggest Tiger developed an instant liking for her and proposed her. Despite different communities and oppositions Sharmila and Tiger went on to enjoy a very happy and model married life. India’s wonder boy who created history by scoring three consecutive centuries in his debut, Mohammed Azharuddin’s marriage to Sangeeta Bijlani, a top model, former Miss India and film actress was really startling because Azharuddin was already married with two sons. Though the marriage was a success but it brought shame to Azharuddin, whose name figured prominently in the match-fixing scandal. 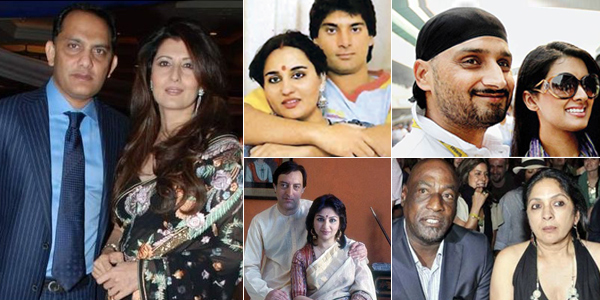 West Indies master blaster Viv Richards’s romance with TV and cinema actress Neena Gupta in the 1980s hit gossip magazines. The duo shared an unconventional relationship and was blessed with a daughter, Masaba, who lives with her mother and is today a renowned fashion designer. Pakistani ace batsman Mohsin Khan and Bollywood actress Reena Roy’s marriage was another stunner because Reena Roy quit Bollywood and went and settled with hubby Mohsin Khan in Pakistan. But later differences rose and the two divorced. Reena Roy returned to India and, of course, to Bollywood. According to latest news Indian spin maestro Harbhajan Singh has finally decided to marry Bollywood actress Geeta Basra, who was recently seen opposite Emraan Hashmi in THE TRAIN and Dharmendra starrer SECOND HAND HUSBAND. The duo have been in relation since many years but hid from the paparazzi. However recent reports reveal the duo will merry on October 29 at Hotel Club Cabana in Phagwara – 20 kilometers from Harbhajan’s hometown of Jalandhar.